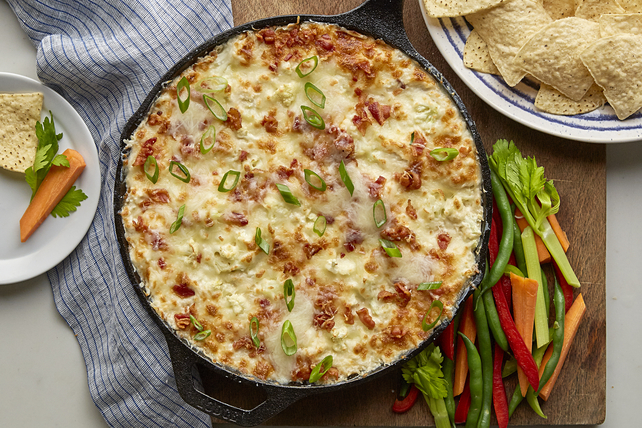 Blend together deliciousness with our Cheesy Cauliflower Dip with Bacon. Guests who want to try something new and tasty are sure to love this tasty hot cauliflower dip recipe. Use pulsing action of food processor to process cauliflower until chopped to pea-size pieces. (Some recognizable small florets may still remain.) Place in large microwaveable bowl. Add water. Microwave on HIGH 3 min. ; stir. If necessary, continue microwaving 2 min. or until any larger cauliflower pieces are softened. Drain cauliflower. Add yellow onions to reserved drippings; cook 3 to 4 min. or until softened, stirring frequently. Add cream cheese and hot sauce; cook and stir 2 to 3 min. or until cream cheese is completely melted and sauce is well blended. Stir in cauliflower, mayonnaise and 1-1/2 cups shredded cheese; smooth top. Serve with vegetable dippers and tortilla chips. Substitute an ovenproof regular skillet or 1-L casserole dish for the cast-iron skillet. You will need about 1/2 large head of cauliflower to get the 4 cups florets needed to prepare this delicious dip.